Although the world's first coins were Greek coins made in Lydia about 640 BC, is seems clear that India and China both invented coins independently within a few centuries of the Lydians. The earliest Indian coins were silver, and it was not until about 100 AD that the Kushan emperor Vima Kadaphises introduced the first Indian gold coin, which was a gold dinar bearing the image of Shiva. 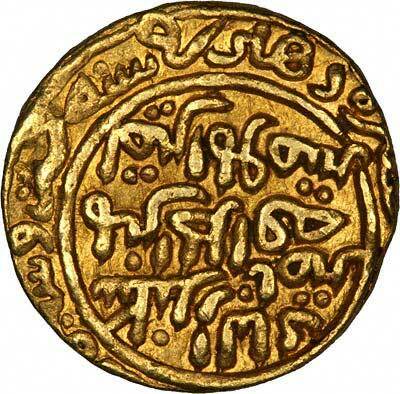 So India's history of issuing gold coins dates back almost 2,000 years. 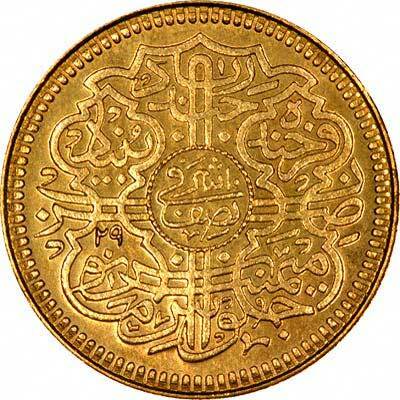 With this long history, it is no surprise that India has produced many different denominations of gold coins, which include Dinars. Staters, Kahavanus, Pagodas, Tankas, Ashrafis, Mohurs, Gadyanas, Bhairava Gadyanas, Varahas, Fanams, Koris, Xerafims, and Tolas. Gold appears to be woven into the very fabric of Indian life. Indian brides traditionally have a dowry of gold. This is usually in the form of 22 carat or 24 carat gold formed into jewellery, often incorporating gold coins. Wedding guests also give gold coins as lucky wedding gifts. Perhaps because of a mistrust of banks, the government or the tax system, many Indians store their wealth in the form of gold bars or gold coins. Perversely given the popularity of gold in India, there are not many collectors of Indian coins in general or Indian gold coins in particular. We are certain that over centuries, many ancient rare and ultimately valuable gold coins have been melted and made into jewellery. Although we have many Indians amongst our customers, mainly doctors, most only buy bullion coins such as sovereigns, krugerrands and Canadian maples. We think this is a great shame because we are sure that there are many interesting and very affordable Indian gold coins currently available, and even now there are probably rarities being melted down. Although our policy is to be deliberately conservative about giving investment advice or making investment claims for our coins, it appears obvious that collecting series which are currently unpopular or unfashionable must be a good idea. Firstly because the collector can obtain interesting, unusual and rare coins at a fraction of the price of coins from a popular series, secondly if and when interest increases, prices are certain to increase accordingly. Thirdly, it will help to stop rare coins being lost for ever by being melted down. 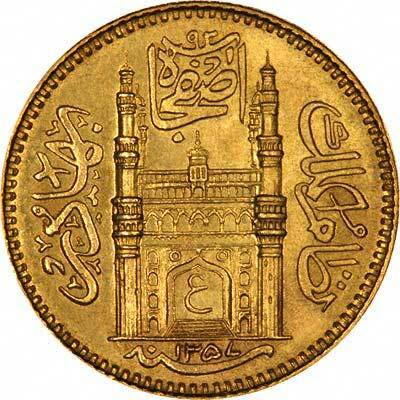 We sometimes have a small selection of Indian gold coins. To be perfectly honest, like most westerners we find Indian coins difficult to read and identify, and Indian coins are not one of our main areas of expertise or specialisation. Because of this, any Indian coins we offer for sale may not be perfectly identified and catalogued. In these cases, this will usually be clear from our descriptions. We struggle to read Persian!